Now seems as good a time as any to talk about how Akira Kurosawa changed my life. When I was 11 or 12 years old, my mom took me to see Ran (1985) on the big screen. I always loved going to the movies, and since we didn’t have a television, we went to the movies a lot. Until I saw Kurosawa’s Ran, however, I don’t think I’d thought much about what actually went into making a movie. Ran changed all that. Everything about it was vividly present onscreen — bold color choices, meticulously arranged visual compositions, music too quiet and gentle for the bloody violence it accompanies, the overly theatrical makeup for the actors — and I drank it all in. I’ve read some critics talk about seeing Citizen Kane (1941) for the first time and becoming acutely aware of cinematography, music, camera movements, and so on. That was my experience with Ran, and it began my love affair with Kurosawa. It was a love affair that continued with Seven Samurai (1954) (which I also saw on the big screen in a revival house shortly after seeing Ran), Throne of Blood (1957), Yojimbo (1961), Dreams (1990), Rashômon (1950), Kagemusha (1980), Ikiru (1952), High and Low (1963), The Hidden Fortress (1958), and Stray Dog (1949). I can’t claim to be a Kurosawa completist, though. He directed a lot of movies that I haven’t seen. I think I’m spacing them out, since in most cases I’m blown away all over again and if there’s a Kurosawa movie out there that I haven’t seen, it’s something to look forward to. 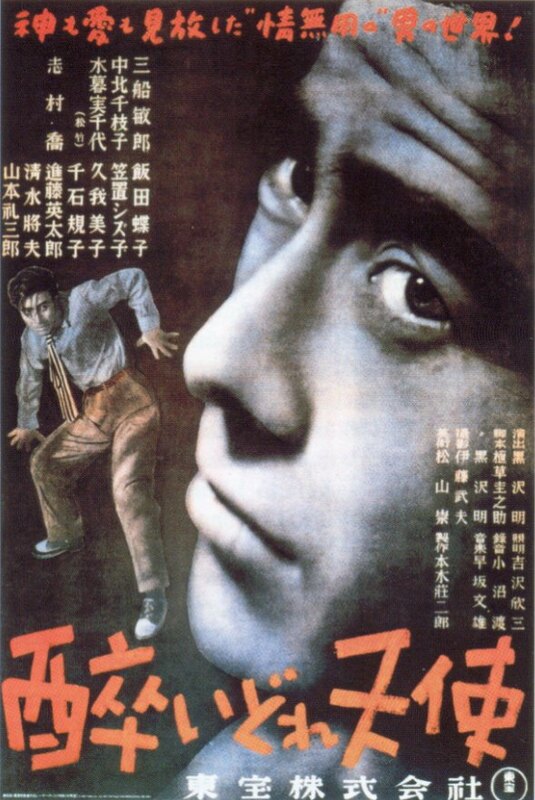 While I wasn’t exactly blown away by the last new-to-me Kurosawa film I watched and reviewed, No Regrets for Our Youth (Waga seishun ni kuinashi) (1946), I was blown away by Drunken Angel (Yoidore tenshi), which I’d also never seen before. It’s not just the actors that make Drunken Angel a great film. The ways the visuals help to tell the story, the three-dimensional characters, and the way the film’s themes are clear and straightforward without being heavy-handed … all of these are hallmarks of Kurosawa’s best films. 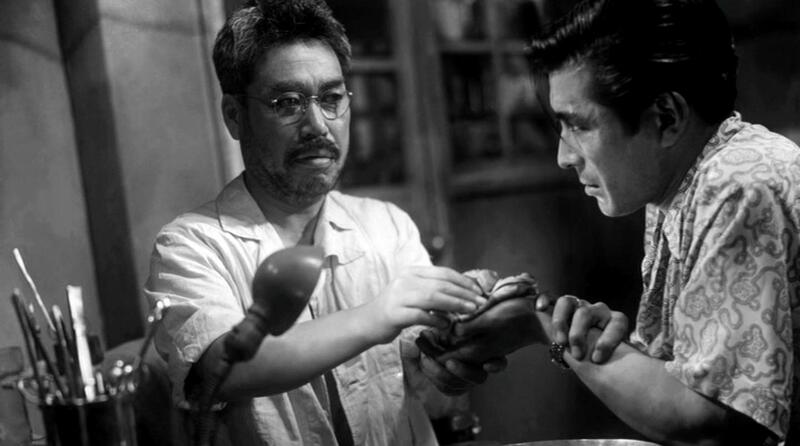 One day a young Yakuza thug named Matsunaga (Mifune) walks into Sanada’s office to have a hand wound treated, but the doctor suspects Matsunaga has a bigger problem — tuberculosis, which was rampant in post-war Japan. With the swagger typical of a young gangster, Matsunaga refuses to submit to treatment or to doctor’s orders, a problem compounded by Sanada’s angry and blunt way of talking to his reluctant patient. Things are made even more complicated by the reappearance of Matsunaga’s gangster boss, Okada (Reisaburô Yamamoto), who returns from prison in a haunting and memorable scene. I referred earlier to Mifune as a “force of nature.” Even here, as a young actor, he throws everything he has into the role. Mifune was an actor who used his entire body to tell a story — he could have been a great silent film actor. The setting of the film is almost a character itself. The cramped, overcrowded little city was designed as a large open-air square by production designer Takashi Matsuyama, who originally built it for These Foolish Times (1947), a comedy about the post-war black market. It was expensive, so instead of demolishing it, the Toho Company wanted Kurosawa to use it for his next film. Kurosawa had about a third of the set torn down to create the enormous cesspool in its center. During the American occupation of Japan from 1945 to 1952 there were multiple censorship boards that forbid things like the use of U.S. military uniforms in Japanese films, so Kurosawa had to find a way to depict the occupation without actually showing it. Images of westernization abound, even though no Americans actually appear in the film, and the visual symbolism of the cesspool is pretty easy to interpret, especially when the city is reflected in the darkness of its bubbling surface. Drunken Angel wasn’t released in U.S. theaters until December 30, 1959. Kurosawa wasn’t well-known outside of Japan until Rashômon (1950), which was a big hit on the film festival circuit in 1951. If you’ve never seen any of Kurosawa’s films, Drunken Angel is not a bad place to start. Seven Samurai might be his most exciting, iconic, and accessible picture, but it’s nearly three and a half hours long. If you’re unsure about Kurosawa and don’t want to invest more than two hours of your life finding out if his films are for you, Drunken Angel is about an hour and 40 minutes long, and it’s an excellent movie. 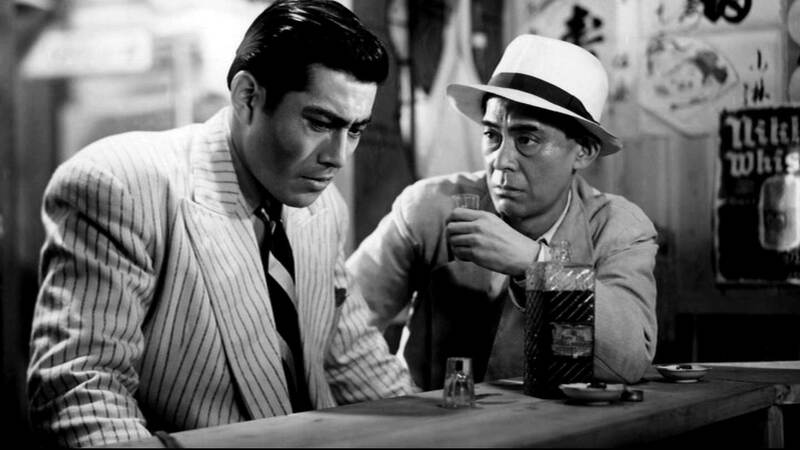 *Although Drunken Angel was the first time Mifune and Shimura acted together in one of Kurosawa’s films, it was not the first time they acted together. Their previous collaboration was in Senkichi Taniguchi’s Snow Trail (Ginrei no hate) (1947), which was written as well as edited by Kurosawa, and is about a trio of bank robbers hiding out in the mountains with a father and daughter who do not suspect that they are criminals. Posted in 1948, April 1948 and tagged Akira Kurosawa, Chieko Nakakita, 酔いどれ天使, Film Noir, Foreign Films, Japanese Cinema, Michiyo Kogure, Reisaburô Yamamoto, Takashi Shimura, Toho Company, Toshirô Mifune. Bookmark the permalink. Great review. Kurosawa really brings something new to the genre in terms of style. We watched this quite recently as part of our noir-a-thon and have a couple more Kurosawa flicks coming up which we’re very excited about. Sounds exciting. Which Kurosawa flicks do you have coming up? High and Low and The Bad Sleep Well, we also rewatched Stray Dog recently. Discovering these films was a real eye opener, I’d always sort of assumed when people talked about Kurosawa that they were talking about samurai movies. More fool me. Well, I think his samurai movies are great, so I understand why they sometimes overshadow his other films. But I definitely don’t think they’re better, just different. High and Low is one of my favorites. Just a great, well-made police procedural. Like Stray Dog, but more controlled and elaborate.